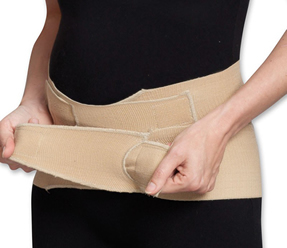 An abdominal binder is designed to provide compression while giving you support and comfort following any type of injury or stress on your body. Abdominal binders are pre-fabricated and manufactured from state-of-the-art materials and are designed to provide you with comfort and support at every stage of your recovery. Abdominal binders help to relieve backache, fatigue, pelvic pressure pain, hernias, hip pain, diastasis, blade issues, pre-term contractions, and poor posture. A Superb Maternity Lifting Support! BabyHugger’s® central lift takes weight off the back, bladder, veins and ligaments. It lifts both from the top and from each side to provide even support. BabyHugger® is adjustable and will fit women up to throughout their pregnancy. BabyHugger® size is determined by your pre-pregnant pant size. BetterBinder® supports back muscles. It stabilizes excessive joint motion in the pelvis, spine or ribs and REDUCES PAIN. BetterBinder® is so comfortable that patients can sit and even eat while wearing BetterBinder®. It can be worn all day and at night. BetterBinder® brings welcome comfort and security.Itcontours around every body shape smoothly and comfortably. Preferred tension is easily achieved. Unlike one piece, stiff, non-conforming binders, BetterBinder® fastens all the way – top to bottom. BetterBinder® is reminiscent of the famous SKULTEDUS BINDER – used years ago and still missed by OB nurses and doctors. BetterBinder® supports and stabilizes abdominal muscles after delivery and helps new moms get out of bed more easily. DURING PREGNANCY, BetterBinder® can support the belly and back, adapting well to mom’s changing shape. Lil’Lift® is perfect for the woman who wants smart support but doesn’t want all the lift a BabyHugger® provides. (Lil’Lift® provides about a third of BabyHugger’s® lift.) Some women wear a Lil’Lift® early and a BabyHugger® later as their belly gets bigger and heavier. Our unique latex-free elastic has lots of lifting power AND very soft edges for pure comfort. Lil’Lift’s® simplicity is refreshing with only one simple fastening. There are no other straps, hooks, buckles or adjustments. Put it around your belly, fasten it and you’re done. Lil’ Lift’s® 3 inch width is perfect to lift your belly – it won’t dig into your groin or fold over as wider belts tend to do. Lil’Lift® will stay flat and comfortable – exactly where you put it! Learn why Compression Management Services / The Lymphedema Centers is the right place to come for your compression therapy and lymphedema compression treatment.